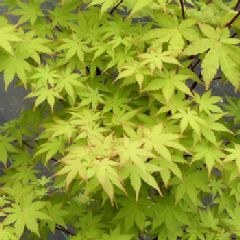 An upright, rounded, branching, deciduous shrub or very small tree with toothed, deeply lobed leaves, light green in spring, golden-yellow in summer, and yellow in autumn. Insignificant flowers in spring followed by winged seed pods. Height 4m (13ft), Spread 5m (16ft), 20-50 years to maturity.